Sometimes you don't want your little kids to go outside of your house by themselves or get into a room which has potential danger like your workarea without your knowledge. Here KidGuard can help to alert you if such a situation occurs using Walabot and Alexa. How does it work? When a target, who is a kid approaching a safeguarded area, opens the door (detected with door switch). The alarm (buzzer) will go off because a kid is shorter than an adult (using Walabot to track the target's Y value). Then what is the role of Alexa? Alexa will be used here to turn on or off the KidGuard system. The buzzer will go off only if the KidGuard system is activated and there is a violation (kid opens the door). Follow this step to get your Raspberry Pi ready. Follow this step to install Node-RED. Follow this step to install the Arduino node for Node-RED. I am using Firmata in this project. 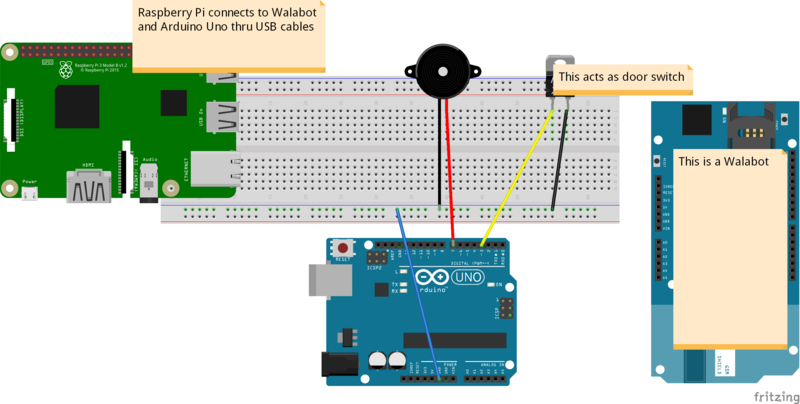 You need to upload the Standard Firmata to the Arduino Uno, follow this link to accomplish that. Follow this step to install the Alexa Local Node-RED module. Follow the instructions here and here to complete this step. Checkout the Hello Walabot app here to verify you have setup Walabot successfully. Import the Node-RED Flow (KidGuard Flow) from the code section below. Check out the Python code (KidGuardWalabot.py) from the code section below. Why demo #2? Because demo #1 (see below) does not tell the whole story. Demo #1 tells you how to turn on and off the KidGuard. It shows you the result when there is a violation which will cause the buzzer to sound. Demo #2 tells what will happen when a tall target open the door (disconnect the door switch) and the buzzer will sound. How does the KidGuard know if a target is tall or short? When the target is lower than the center of a Walabot board, it will register a y value which is less than zero (y<0). When it is a taller target, the Walabot will register a positive y value (y>0). This video demos that when the KidGuard was turned on and a tall target opened the door, the buzzer did not sound. Here I standed in from of a Walabot board and disconnect the door switch. And the buzzer did not sounded. This is another video which demos that a short targer opened the door. In this scenerio, I squatted below the Walabot board's center to pretend as a kid. When I disconnected the door switch, the buzzer sounded and I needed to tell Alex to turn off the buzzer. KidGuard devices: kid guard and buzzer. The following video shows how to activate KidGuard with Alexa by saying "Turn on KidGuard". There will be not a lot visualization in this video. This video shows simulated demo where a violation (breaking the door switch connection) will trigger a buzzer. You will need to attend the situation by manually ask Alexa to turn off the buzzer. Thanks to Ron Dagdag, Johnathan Hottell, and Harold Pulcher (Microsoft MVP).